Search Engine Optimization (SEO) is a big topic, and there are a lot of aspects to a great SEO strategy. As a small business, one of the easiest and most effective things you can do to improve your SEO is to write good content and use relevant keywords in a few important places throughout your site. You may know about some places to use keywords on your site, but many sites aren’t taking advantage of all the important locations for keywords. Or you may know where to put keywords, but not how to come up with the right keywords or how to use them strategically. First, you need to identify the right keywords and key phrases for your site. Think about the terms people would use to search for your business. Think beyond your business name and your product/service. People often search for locations, even very local ones, like a small town or nickname for a small area of a big city. Think about alternate words potential customers would use when seeking out a business like yours. And get specific about your offerings. For example, a photographer can use terms like “engagement photos” plus words like children, newborn, outdoor, first birthday, etc., as well as names of specific parks or locations that the photographer shoots at. And a plumber might use words or phrases about specific services they provide, parts they install or repair, as well as brands that they work with. I recommend doing a brainstorming exercise, where you just start by listing some categories for keywords and then just list every word or place you can think of that might describe your business or your web site. Start with the categories locations, products, services, clients, and add more categories if you need. Then list under each one all of the potential keywords that you might use. You can’t use all these keywords everywhere of course, but keeping a list of relevant keywords in mind when designing your site or updating your pages is really helpful. Here’s an example of what my brainstorming might start out like. I’d want to keep going to come up with more terms and keywords, but this gives you an idea of what it would look like. The first, and possibly most important, location for keywords on your web site is in your page titles. Ideally, each page of your site should have a unique title that describes the content of the page and site with relevant keywords and phrases. Don’t just use your company name for every page title. Instead, use the applicable keywords and phrases you came up with in the previous step. For example, include the product or service described in the page, and your location if that’s relevant. Don’t overdo it with keywords though – the title is limited to about 60 characters or less. And keep in mind that the title shouldn’t just be a list of keywords – it needs to be readable to people searching for your page, as it appears in bold in search engine results. The meta description is also important, but not because it helps determine where you rank in search results. Instead, this description affects what your links look like on the search engine results page. A good description entices readers to click on your link versus other links that may come up in their search. Just like your page title, your description should be customized for each page. Search engines limit this description to 160 characters, so you need to be concise about summarizing why visitors should click through to your site. If you don’t specify a meta description, Google and other search engines typically pull the beginning content from your page, which often isn’t the strongest summary of your content or draw to your page. It also often cuts off mid-sentence, which is obviously not ideal. Here’s an example of my page title and description when you search for Smyrna headshot photographer. Your content itself is probably the most obvious place to use keywords, but it’s also the hardest for some people. Of course your primary objective should be to write a page that is interesting and informative to your human audience. But your writing is also “read” by search engines and so it’s important to keep them in mind as another audience. A page just filled with images or videos and doesn’t have a lot of text is missing a big opportunity for SEO keyword usage. But you also don’t want your page to read like a jumbled collection of keywords only. The goal is to work your applicable keywords naturally into headings and sentences where it makes sense. Headings are especially important, as search engines often give them more weight than regular text, as they should be a better indicator of the page’s purpose. As for your body text, you want your writing to flow and sound natural to a reader, while still taking advantage of opportunities to use your keywords as appropriate. Work into your writing your location, your product/service names, and other keywords. And be sure to use variations of these terms interchangeably throughout your writing since you don’t know what words people will use to search. For example, I use the words photo, photography, images, pictures, portraits, photo session, mini session, etc. throughout my web site. I also frequently mention my little town of Smyrna, but also work in my county name, and the names of neighboring towns/cities when I do sessions there or have clients from there. Images are also a big part of web site content and an important aspect of a good SEO strategy, which may seem confusing. But image names, titles, and alt text should all be customized to include relevant keywords for the image and your site. This really deserves it’s own post to really cover fully, so I wrote a separate tech tip about optimizing your images for SEO purposes. If your web site was designed in WordPress, I highly recommend the Yoast SEO plugin. The free version is very good, or you can upgrade to the premium version. This plugin lets you easily customize your page titles and meta description site-wide or per page. It also lets to specify a keyword for the page and analyzes your content to see if you’re using the keyword effectively. Here is a screenshot of some of the Yoast SEO tools for this page. If you use WordPress without an SEO plugin or you use another Content Management System (CMS) for your web site, your page title likely comes from whatever you specify as the page/post title to display at the top of the page, and your page description may not be editable. Remember the description doesn’t affect your rankings necessarily, but it does improve the appeal of your links on the search engine results page. 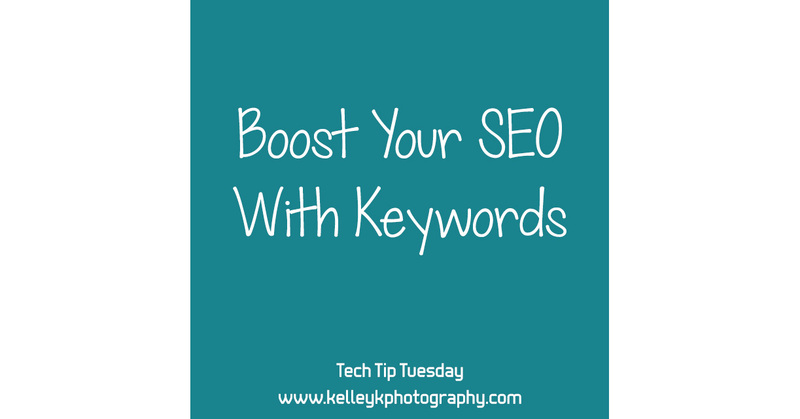 These tips should give you some tools to help get you started with using keywords to improve your SEO. See part two of this series about image SEO strategies to further step up your SEO game. If you have any questions, leave a comment below.